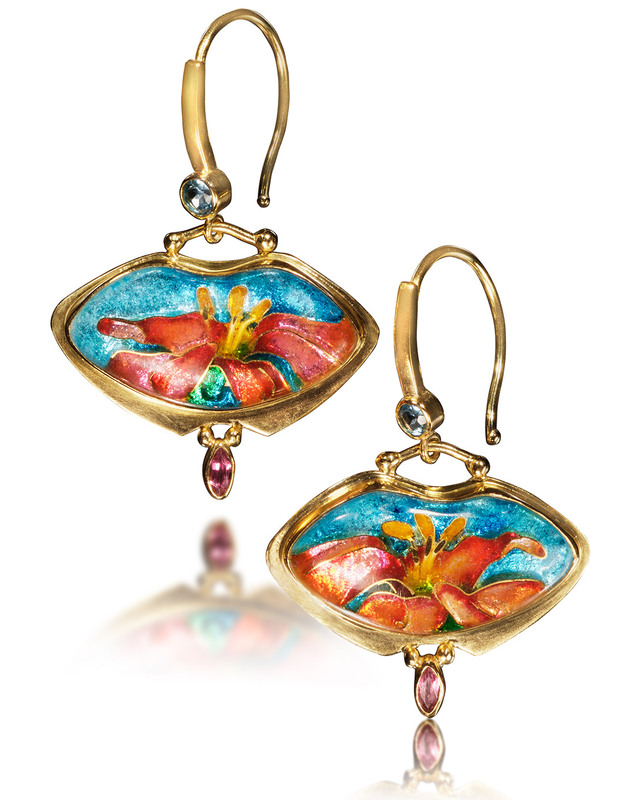 Enamel Earrings Canna are a cloisonne jewelry piece created by Patsy Croft. They belong to Spring collections of amazing enamel jewelry with unique jewelry designs. What makes you think it is Spring? Birds chirping? Flowers blooming? Yes, and Canna is a pair of cloisonne enamel earrings to ornament yourself with, feeling the join of Spring. This is exactly how I felt this Spring when I created these flower enamel jewels. I draw from nature to inspire me in my creations of enamel jewelry. I think most artist of any form create from their personal emotions that are influenced from their surrounds and environment. Walk slowly, smell the earth and be inspired. Contact me anytime for a handmade enamel jewel to reflect your joy of the season.